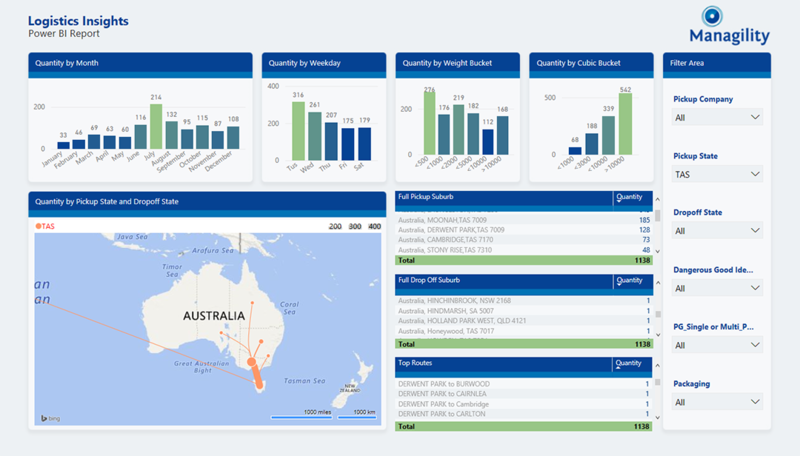 The Managility Logistics Optimization based on Power BI enables organisations with large scale shipping operations to gain valuable insights and improve the process. 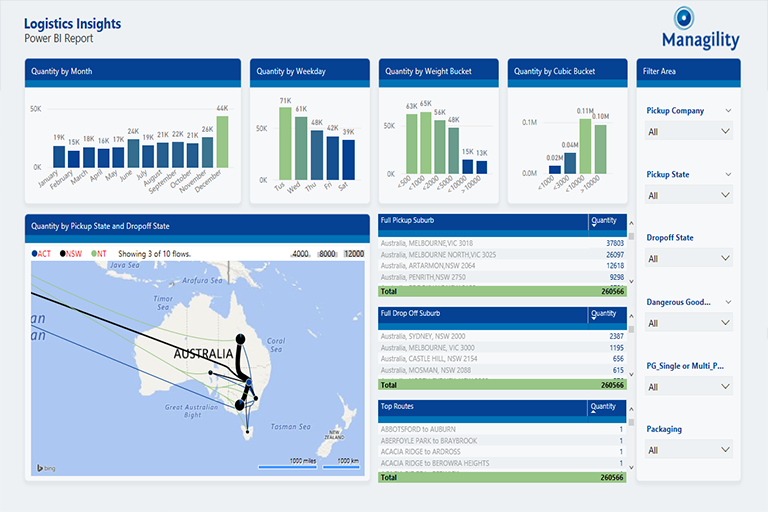 Managility just completed a project with a large retail company analysing and optimising their shipment processes based on a Power BI solution. The relevant data set included 300.000 annual shipment transactions with all relevant details like pickup/drop off location, weight, volume, provider and shipment cost as well as a pricing data from a variety of logistics companies. The initial step involved gaining insights into the data and providing the client with a clear picture. 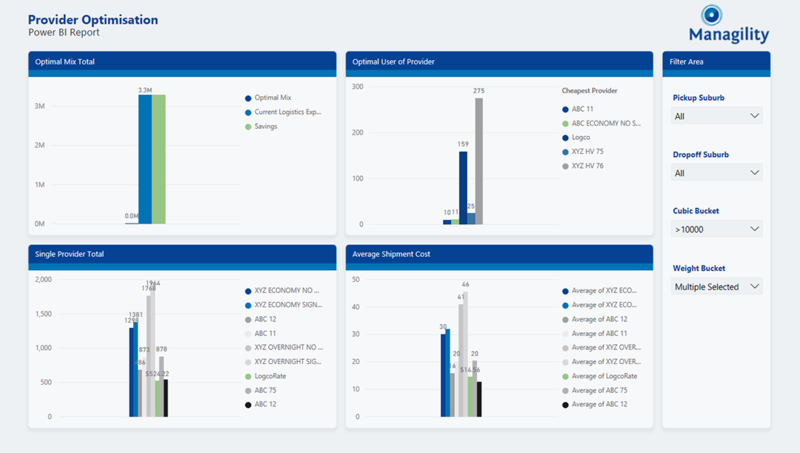 The outcome is shown in the dashboard below (for confidentiality reasons all data is anonymised). 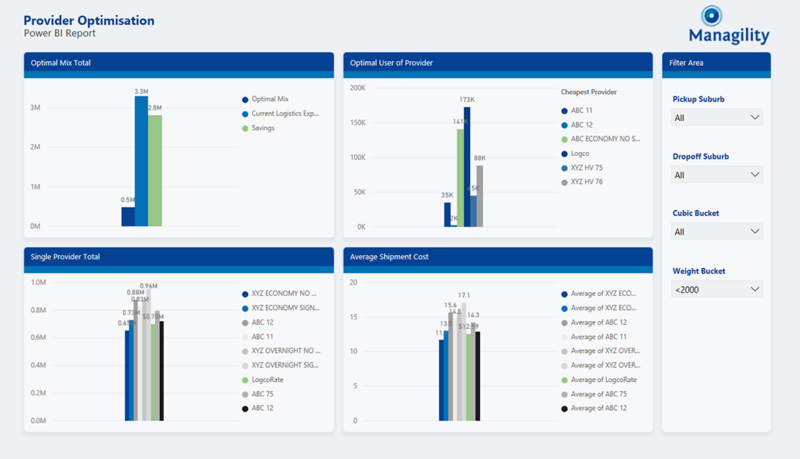 It enables insights into developments over time, grouping data into weight and volume buckets, rankings of top sender and drop off locations as well as a variety of filter options (e.g. dangerous goods etc.). Helpful insight was gained through a new custom visual called "Flow Map" that visualises route details e.g. the thickness of the link between two locations. The next step in the project was focused on realising tangible savings. Shipment rates of all relevant logistics suppliers were added to the model. This fairly complex requirement with a variety of varying rate parameters like availability in the route, differentiations by weight, time of day, urgency, volume etc. was handled effectively with Power Query. DAX calculation logic was then implemented to determine the optimal provider/ rate option to minimise cost. The results of this process are available in an interactive dashboard that includes all providers and their shipping products. As shown in the screen shot below savings of around $1m through using an optimal mix of logistics products was identified that can then be further filtered using the criteria on the right. The projects was initiated using Managility' s Fast Start program that included clarification of project deliverables and priorities, the building of an initial prototype and a project plan for the entire project that in the end took only 10 days from start to finish. 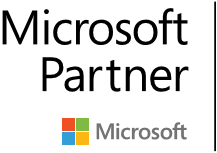 Using legacy BI solutions that Managility has been using beforehand, a project like this would have taken weeks.